On July 23rd, a car supposedly malfunctioned in the early morning at Whiskeytown Lake, which sparked the Carr Fire in Shasta County, soon began torching my city of Redding, California, and has decimated over 98,000 acres, burned over 818 homes, and has claimed at least 6 lives. The sad news a week later is that only 20 percent of the fire is contained, and continues to burn, threatening more people’s lives. On July 20th my husband Kevin and I left Redding to enjoy a relaxing vacation in Tahoe. We thought all was well back home, when we received the news on the 26th about the Carr fire potentially engulfing Redding. We began to get texts from our friends saying that the wind would be shifting later that night and the fire could be heading toward Redding. That Thursday night, we were with our friends, eating an incredible Italian meal, when all of a sudden we got the message that the fire was only a few miles from our house, and that many were being evacuated. Everything seemed to stop around me, and I felt like I was in slow motion — a dream — a nightmare. We texted our friends, who began sending us frightening videos and accounts on how unpredictable, fast growing and out of control the fire was. 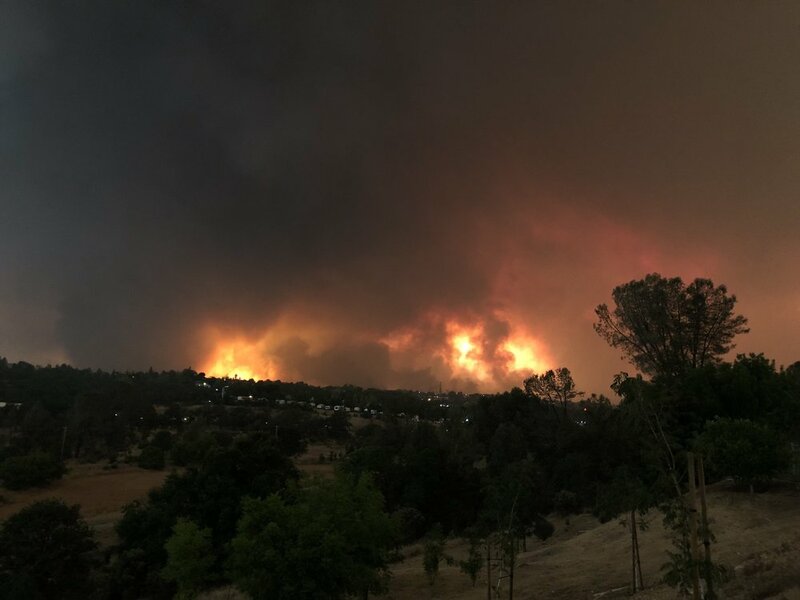 As we watched the fire relentlessly invading into Redding’s city limits, we realized that so many of our friends and church members were also in jeopardy of losing their homes. All of a sudden, I knew that we were in for a fight, but not something that could be fought naturally — this had to be confronted in a supernaturally way by bringing Heaven to earth. Immediately we called and texted our friends, and asked them to stand with us. Kevin and I realized that we could not stand alone, but needed the help of those who loved us. I also posted our need for help on social media, so that people in our online community around the world would be praying for our, and our city’s protection. Kevin and I are so thankful that we have invested in a community that stands together in the good times and hard times to fight for God’s will to be done here on earth. I began to access my prayer language, quote verses about God’s protection, and began asking for angelic intervention, as I wrestled in the spirit throughout that first night. At midnight, while the fires were raging, and could be seen from our outside deck in Redding, we joined with friends on our phone and declared that the winds would shift and the fire would move away from Redding. Proverbs 18:21 states that, “The tongue has the power of life and death, and those who love it will eat its fruit”. Our declarations make a difference! All that night, Kevin and I wrestled in prayer for God’s intervention, as we declared the promises God has given us for our home. Do not be anxious about anything, but in every situation, by prayer and petition, with thanksgiving, present your requests to God. And the peace of God, which transcends all understanding, will guard your hearts and your minds in Christ Jesus (Philippians 4:6,7). We began to thank God in advance for my house being saved, we thanked him for the firemen who were risking their lives for me, we thanked God for being in charge of the outcome, and we thanked God for being a Good Father! A thankful perspective kept my heart from fear and worry, and released faith to believe that God would help us. Just like when Jesus gave thanks when there seemed to not be enough food to feed the multitude, and got supernatural breakthrough, so too, our thankfulness prepares the way for breakthrough. When we got up the next morning, the winds had shifted, and the fires were being pushed in the opposite direction. We got word from many of our friends that their homes had been spared through prayer as well. While we battled and have won through prayer on so many fronts, we have also grieved those who have died or lost their homes or businesses. We are grieve over the loss of our beautiful natural wildlife around Whiskeytown Lake. During this process, the firefighters have shared about how our intercession, cards, and encouraging posters have helped them fight this fire. After one week, this fire has not conquered the human spirit to fight with weapons on the ground and in the Heavenly realms. I believe Redding will rise from the ashes and will be crowned with splendor. Jesus is calling us to, “rebuild the ancient ruins and restore the places long devastated; they will renew the ruined cities that have been devastated for generations” (Isaiah 61:3,4). All of us have most likely experienced raging fires, like the Carr fire, that has come against us either in our relationships, pursuing our dreams, or feeling secure for our future. Remember, that support from others, hearing God’s voice, declaring, and giving thanks will be key for your victory. I can hardly wait to share with you stories of victory and breakthrough as we press in for God’s mercy and blessing for protection and restoration. Remember you are Born to Create, and declare life!